Robert M. Chapple’s blog: ‘An irregularly updated bolg about archaeology and related madness! might just be good’. Vox Hiberionacum: An excellent blog specialising in Early Irish Christianity and Early Medieval Ireland. Prehistoric Music Ireland: Experimental archaeology site featuring reconstructions of prehistoric instruments. The Standing Stone: Features information, pictures and discussions about archaeology sites in Ireland with a focus on the midland region. Also has new a forum section for discussing archaeological sites etc. The Photographic Archive of Irish Archaeology: A brilliant facebook page set up by Ed Lynn which has hundreds of photos of archaeology in action from last 30 years. 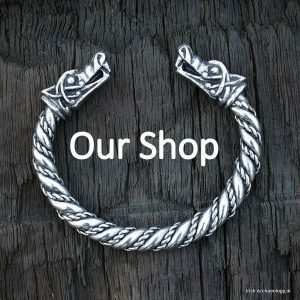 The Irish Archaeology Shop: You will find a handpicked selection of beautifully crafted objects here, based on and inspired by artefacts from ancient Irish, Celtic, Viking and Slavic cultures. Archaeology.ie Government website detailing all the recorded archaeological sites in the country with associated mapping and grid references. National Roads Authority Archaeology : The latest archaeology news from the major road schemes in Ireland. Downloadable copies of the NRA archaeology magazine Seanda available. Unpublished Excavations: Details of some of the more important unpublished archaeological excavations in Ireland. On The Discovery Programme website. Royal Irish Academy : Ireland’s Academy for the sciences and humanities. PDF copies of journal articles available for download. 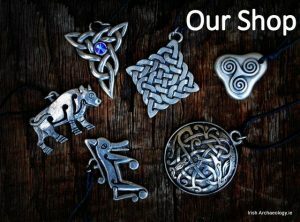 Royal Society Antiquaries Ireland: Aims to preserve, examine and illustrate all ancient monuments and memorials of the arts, manners and customs of the past, as connected with the antiquities, language, literature and history of Ireland. Society for Medieval Archaeology: Established to study evidence of the past, whether standing buildings, landscapes, buried remains or artefacts in museums. Scottish Archaeological Internet Reports: A collection of digital reports relating to Scottish archaeological sites. The Achill Archaeological Field School: A training school for students of archaeology and anthropology from Ireland and from across the world. Archaeojobs: Site listing the latest job offers from around europe. Archaeology Tours in Ireland: Specialised tours in archaeology and ecology (in German or English). ‘Tailored to your needs in the beautiful North West of Ireland. Our tours are based on your interests and needs’. Time Travel Tours: Tours and Independent Travel to Ireland and the British Isles specializing in Genealogy and Gardens.